OMET XJet printing press is the extraordinary result of the combination between the renowned OMET flexo quality and DURST digital inkjet printing technology. This union has realized the perfect hybrid solution able to provide the maximum level of productivity independently from the length of the run. Nobody but the printer decides whether to use flexo or digital, or both of them, according to daily label production and brand’s requests, thus choosing the most convenient technology at every run. The OMET XJet offers an innovative solution able to extend label printer’s productivity and erase unnecessary costs. 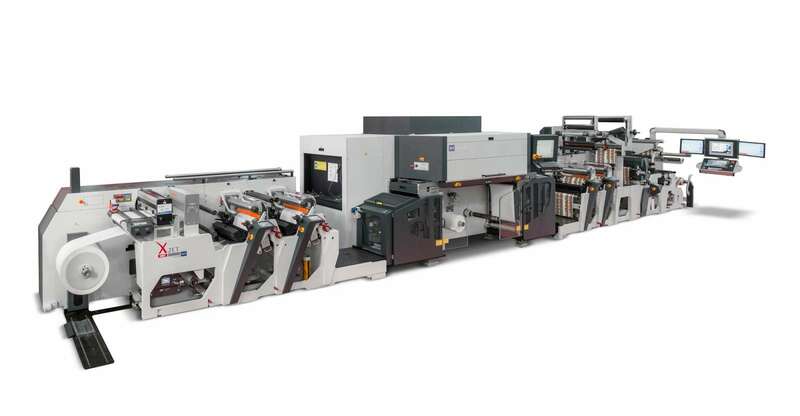 It is the only label press with in-line multi-process configuration, combining DURST Inkjet technology with OMET flexo units, plus exclusive finishing and converting units to obtain the final product always in one single passage. It is able to merge all the advantages of the two printing technologies in one single press. It widens significantly the range of printing opportunities, adapting the production to changeable market trends like personalization, just-in-time deliveries and final product valorization. Label die-cutting section Max. 25"